Some abilities might be easier for some people, but we all have the same capabilities since we all are the same. If you are a creative person, you have a big opportunity in your hands since being creative is one of the best gifts you may have been granted with; it allows you to change things in the world with more ease by being able to imagine and create something different, or even better. If you think you are not creative, don’t worry and just give it a try. You won’t know what you can or cannot do unless you try. In this article I’m going to explain some simple creativity examples you can actually start practicing with, even you consider yourself as creative or not. Not all the patients are the same, so it’s not always recommended to treat them all in the exact same way as you may already know. Sometimes it’s a good idea to try new things, techniques you didn’t learn from your Reiki master. We all have learned several techniques and symbols with Reiki, also maybe you already know that there are several kinds of Reiki. 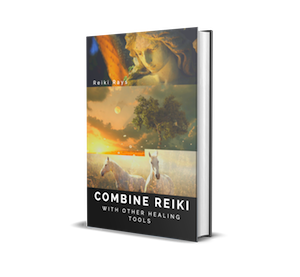 But, like anything else, Reiki can keep growing by practice and meditation, especially through Reiki practitioners who get messages and such, but also through those who are creative. Creativity might help you with your therapy by allowing the Universe to express itself through you, your life, and especially through your hands with your patients. Everything you can imagine and visualize from this world or others and everything you create is part of you and the Universe itself since you are part of it and it is part of you. If you are a creative person or just like trying new things as a therapist, maybe you have already started using different techniques during therapy, maybe just using symbols in a different order, or tried using that new symbol you found on the ReikiRays.com website even you haven’t become a Reiki master nor being attuned on it yet. Trust me, if during therapy you feel it’s ok to use it or that you must use it with a particular patient then it might be, since we as Reiki practitioners, work for improving people’s (and our) lives and health. Following rules it’s ok for learning and to start practicing something, especially when it is something new; but sometimes, especially when you are more experienced, following rules to the letter might restrict you and your spiritual growth and learning process. Therapies and symbols you learned from your Reiki master should be considered as a bicycle’s training wheels, eventually (after you become a master) you can stop using them and change them according to your therapy and patient’s needs. Please notice: I’m not saying that you can do as you please without rules, remember to be humble and don’t feed your ego. As I have mentioned before in my Reiki and Intuition article, we are always receiving messages from superior entities, but sometimes we just don’t understand them until we are ready. It’s not common that a message received from a higher-energy realm just comes to us as a sentence or line of words telling us exactly what to do or not, it’s more common to receive them through images and situations. So, if during therapy you feel you can or have to do something different, then you should, as I always say: trust your intuition. During meditation, you can actually contact superior entities who may give you not only messages but also gifts, tools, symbols and even techniques. Remember, superior entities can communicate with you and send you messages all the time, but those messages will come to you as things you know and understand. It might happen during therapy too. Suddenly you may even get ‘crazy’ ideas from unexpected places. For example, if you like cartoons, videogames, and such things, and during therapy you feel you can throw an ‘energy ball’ to the darkness you see in a patient, or that you can use a ‘sword’ to destroy the darkness in a patient, or even a ‘shield’ to protect you from a dark entity, feel free to use it, if you feel that during therapy then it may be just what your therapy and this patient needs. You can combine these techniques with your Reiki knowledge too, so if you are using a ‘fireball’ you may make it a violet-flame ‘fireball’. Many of these techniques can be easier visualized during long-distance therapies since you are in a deep meditation. If you do this kind of techniques often and you see they work, you can even adopt these techniques as part of your usual therapy, this might be a gift you received from a superior entity and sometimes you can even share it with others in the future! Here, it’s important to mention that not all techniques work with all the patients and not all the techniques work for all practitioners in the same way, for this reason sometimes it is important to adapt techniques to your and your patient’s needs. It takes time to actually know which ones you can share with everyone so they all can have good results too. All of these things make Reiki wider, more varied and stronger. Let your therapy guide you, allow Reiki and the Universe express themselves through you, and keep growing with Reiki since it grows through you too. Next post: How Can Reiki Accelerate Mental Patterns and Subconscious Level Healing via Positive Affirmations?